We visited the Vatican Museum last October and of course, one of our must-do's on our list (we were Virgin Voyagers to Italy, after all) was the La Cappella Sistina (Sistine Chapel). Being a life-long artist and photographer, of course I had to see the major work of one of my artistic heroes: Michelangelo. To see it, one needs to take a tour of the Vatican Museum itself and go through the one way in, one way out maze following throngs of tour groups and the rest of the masses with the same thing on their own must-so list. We thought we were ahead of the game by booking a "private" tour--a guide just for we three. Boy, were we wrong. Our guide thought he was doing us a favor by going very slow and getting into long-winded descriptions of just about everything we were seeing--at the beginning of the tour. Even though I told him ahead of time to keep it brief for Lucas (12 years old at the time) covering only the things a kid would love hearing about, he kept going on and on and on... so much so, that before we were 25% of the way through the tour, the huge tour groups were passing up by and swallowing us up into their chattering, sweaty, shoving and pushing masses. In the end, we were only allowed 5 minutes to enjoy the masterpiece of the Chapel's ceiling... several of which we spent standing shoulder to shoulder with people who didn't know what they were even looking at--or for what reason--only that it was on their must-do list. There are only benches on the sides of the Chapel, so good luck getting a seat to relax and take it all in (we got a seat for perhaps 2 minutes). Oh, and of course, no picture taking, although people push this rule all the time with their smart phone cameras--with the chance of getting booted out. All in all, not exactly my idea of relaxing and pondering a magnificent work of art. So, I had an idea. If you are a student of art, or someone else who has studied the work of the Renaissance Masters, like the Sistine Chapel, perhaps you could exclude such must-do's from your own list and study the art online, in the comfort of your own home. 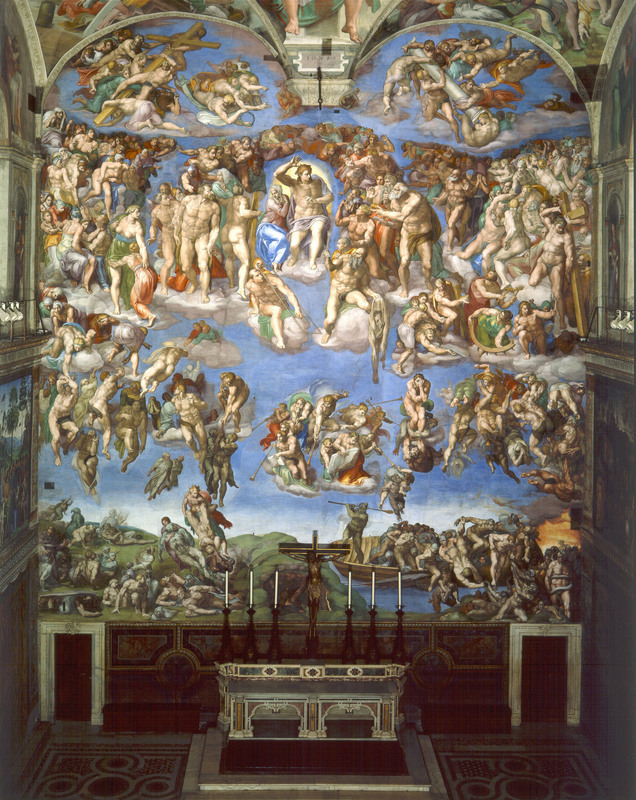 I've put together a gallery of sorts, of online resources where you can take your time and gaze upon the most minute details of the Sistine Chapel to your heart's content--without putting up with the chattering, cackling, sweat, the disrespect (many wear hats even though it IS a church), the rushing and the great expense. 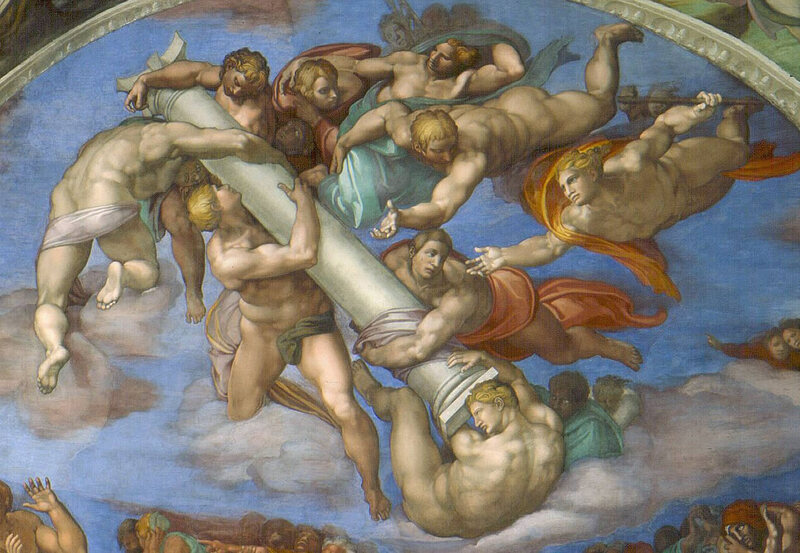 And twenty five years after finishing ceiling of the Capella, Michelangelo painted the Last Judgment on the wall of the Sistine Chapel. 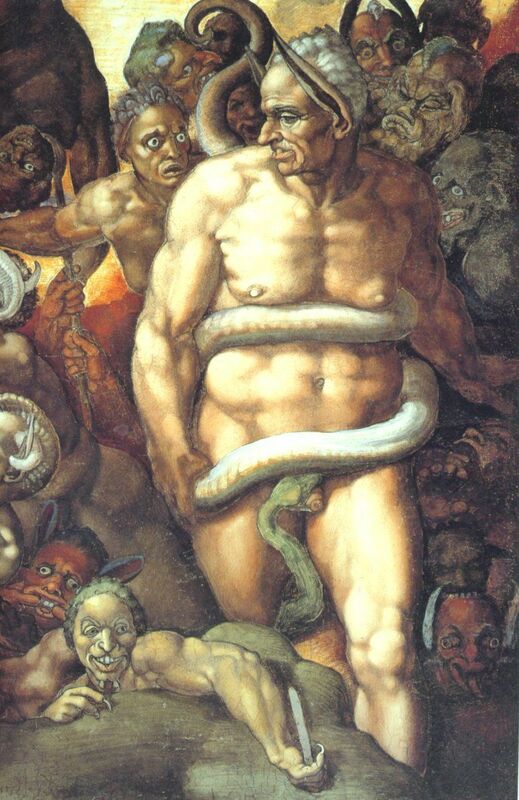 An older, wiser man and being much closer to his own Final Judgement, the work is markedly different than the metaphorical grandeur of the ceiling's frescoes... perhaps more profound and shocking. Move your mouse pointer around to change the view. TIP: There is music on this interactive tour and a zoom function. Scroll in with your mouse wheel or use the = and - buttons in the lower left corner of the display. Place your mouse pointer in the center of the image, turn up the music and scroll very slowly around this masterpiece. It's the best view you can get of the details of the Sistine Chapel. If you enjoyed this post, please share it with your friends... Ciao! Live Cam screen capture of the Pantheon captured as I was writing this post... just as I remember it on an October afternoon last year--crowded. The Skyline Webcams site has the largest collection of webcams in Italy. Check out the progress of the renovations to the Trevi Fountain or simply look at that glorious view of the Amalfi Coast that you remember so well--all live! Click HERE to visit the live webcams! Now, That's a Real Foodie! Yes, even in Italy, there are folletti (goblins), mostri (monsters) and fantasmi (ghosts) this time of year. The more traditional time of year for people dressing up as all sorts of strange creatures in Italy is the two weeks before Lent, for Carnevale, but in the last several years, Halloween is catching on. The Vatican doesn't like the trend, however, because they fear it might change the meaning All Saints and All Souls Day (November 1 - 2) from a day to cherish memories of those who have gone before to just another day to get dressed up and act crazy. The Vatican has little to fear however... Most Italians are still celebrating the religious holiday of All Saints Day in addition to just plain having fun for Halloween. In the nineties, young Romans started dressing up for Halloween and shops began selling costumes, candles and other Halloween related items. There are Halloween parties and even dress-up and candy sharing in schools for the little ones. Obviously, the younger generation are driving the trend toward celebrating Halloween through exposure to American TV and Movies. Watching episodes of Cake Boss on Italian TV creating Zombie cakes also helps. Films like Halloween, Friday the 13th and ET (remember the Trick or Treat scenes?) all played a part. Just don't expect there to be Trick or Treating... at least not yet. For one, visit the catacombs at the Museum and Crypt of Capuchins, a church in Rome where you can visit the underground catacombs where thousands of humans skeletons and bones have been arranged in artistic displays. Artistic, but way creepy when you realize that you are gazing unpon human remains. Corinaldo, a ghostly looking medieval town in Le Marche, has a festival that lasts for days, with nationally famous actors and comics, with lots of food stands, and even a "Miss Witch" contest. For Halloween, the whole town is lit with candles and torches, there are spiderwebs in the narrow streets and alleys, a tunnel of fear, music, food, dancing, and fireworks. On a foggy Autumn night, there couldn't be a more appropriate town to hold a spooky festival in. This is one of the more popular Halloween festivals in all of Italy. The village of Ostra, Ancona hosts a unique and very scary festival during several days in late October celebrating La Notte degli Sprevengoli--spirits who bother people while they’re sleeping by jumping on their stomach, causing night terrors. The Hard Rock Cafe in Rome hosts a full blown, American style Halloween costume party, with fun for the kids... carving jack-o-lanterns and more. In the town of Ravenna there is a theme park that goes all out for Halloween each October--for the entire month. The park is called Mirabilandia, and is a recreation of a medieval castle and village that they deck out with ghosts, ghouls and Jack0o-Lanterns for Halloween. In the town of Castrocaro Terme, about ten kilometers from Forli, the Middle Ages comes to life each October. The townsfolk dress as ghosts and witches and head to the Castle for spooky goings on, food, drink and mayhem. Visitors can dine in the wine cellar of the castle, transformed for the night into a Tavern of Mysteries. In the fortress of Bardi, Parma, after tracking a ghost who lives in the castle, Ghostbusters refresh themselves with the "Cold buffet Death", including bloody salami and pasta creations that would be favored by Hannibal Lector, and then they will be poisoned by the best wines from the region. At the Fiesta dalis Muars (dialect: Festival of Pumpkins), in Ampezzo, the courtyards of the historical center are lit only by torches, fireworks and fabulous light shows with clowns and fire eaters. The festival is held on the night of October 31 and is a reenactment of what Italians call "Celtic Halloween". The muars (pumpkins) are carved, then lit and displayed throughout the streets of the town, where you will also find food, fairies, elves, goblins, fire-eaters, jugglers and magical creatures. If you are in Italy around Halloween time you might want to check out the October Festa della Zucca (Pumpkin Festival) in Venzone, a medieval walled town in northeastern Italy. This festival will really give you that autumn, pumpkin fix that you crave. Although you might not find many Jack-O-Lanterns there, you will find pumpkins and squash of all colors, shapes and sizes--giants ones, too. There is food, art, music, and dancing and prizes are awarded for the largest, heaviest, most beautiful, and most unusual pumpkins. Children participate in a pumpkin-carving contest, while chefs demonstrate their skill in carving intricate floral designs. So, it looks like there are lots of ways to celebrate Halloween in Italy... take your pick. And while most village children won't be knocking on doors yelling "Dolcetto o scherzetto" (Trick or Treat), there is still a lot of good, scary fun for your entire family. If you enjoyed this post, please sneak up on your closest friends, and yell BOO! Ciao! When I was a child, one of the most luxurious and fantastic things I could eat was jewels... the ruby-red gems of the pomegranate... melagrana in Italian. As the Fall came into color, it was a special holiday treat. Dad would bring some home from the his store where he worked as a fruit and deli man. I still eat them the same way... carefully scoring the skin on the surface and then pulling apart segments to bare the shining gems inside. I don't like the idea of slicing into the fruit and cutting any of the rubies in half. I loved twisting and turning them to see the light reflecting off the facets of the individual seeds. Then I'd attack... peeling the paper coverings off the seeds to expose large sections at a time... then seeing how many I could bit off and into my mouth at one time, crunching and bursting those little rubies and filling my mouth with their sweet and tart juice. I always use a small bowl to catch any rubies that get away... then in the end, scoop them up for a last mouthful. Heaven. The pomegranate originated in the region of modern-day Iran and has been cultivated since ancient times--earlier than 3000 years BC--from the Mediterranean region all the way to India. It was introduced into the Americas (especially California) in the late 16th century by Spanish settlers in 1769. Though not native to the Far East, the pomegranate spread to Afghanistan, China, Korea and Japan either by sea voyagers or via the Silk Trade routes. The name pomegranate comes from the Latin pomum (apple) and granatum (seeded) but also has roots in an old French term: pomme-grenade (literally apple-grenade, referring to how the fruit looks like a hand grenade, or a cartoon version of a bomb). A confused use of the name was in heralds and family crests having to do with the Spanish town of Granada (Apple of Granada), even though one came from Latin and the town name came from Arabic. Historically, grenadine syrup was made from of thickened and sweetened pomegranate juice, but nowadays is based primarily on black currants and other flavorings. There is a brand called Bols in Europe that is still made using pomegranate juice. Where grenadine today is used almost exclusively in making cocktails, the original pomegranate based syrup (often with ground walnuts added) was actually used in Middle Eastern cooking to make a sauce, used in the same way tomato sauce is used today. The first time I saw pomegranates growing in Italy was in the Tuscan hilltown town of Pienza. We walked past a little courtyard that had them growing on trees about 20 feet tall. They seemed really at home in the Mediterranean climate of Italia--the tree had dozens clinging from its branches. When picking a pomegranate directly from a tree (if you're lucky enough to be in such a climate), you don't want one with any green skin. A ripe pomegranate can have a range of color, from pink to deep red. The one's we saw growing in Italy were almost a Barbie pink. It should feel heavy for its size and should break off the tree without much effort. If it fights you, leave it on the tree to ripen more. When the fruit is no longer shiny it is nearly over-ripe. When picking them in a super market, be careful... I have selected perfectly looking, shiny skinned pomegranates that have a rich red color only to find they are almost rotting on the inside. Perhaps growers are tinkering with the genetics to give a good looking, long lasting package on the outside just so they can sell to supermarket chains. If you get a bad one (which admittedly is rare) take it back. Personally, I like ones that are mottled with a deep red color... they are usually the most ripe. First of all, you need to get the seeds out of the fruit. The easiest way is to score the skin, break apart wedges of the fruit and then place them into a large bowl of water. Work the fruit gently with your fingers to release the "rubies" from the rind. The skin and pulp will float to the top, the seeds to the bottom. Remove the pulp and skin and drain. Consider using pomegranate seeds or juice (or both) in your recipes. The tart-sweet taste goes well with chicken, pork or lamb. Adding seeds into salads are a natural. The juice reduces well when sauteing, and the whole seeds will look beautiful when tossed into a sauce or a salad. And you can try them for cocktails too: bellinis, margaritas, sangria or smoothies all work well with the additional bright flavor of pomegranate. And nothing can be better than a butternut squash soup topped with pomegranate, or try a ham or turkey risotto flavored with pomegranate juice and topped with seeds. And for a surprisingly good dish, try a reduction of pomegranate over salmon sprinkled with the seeds. Eating pomegranates can reduce the signs of aging... at least, that's what some say. They are very rich in antioxidants and are considered a Heart Healthy snack. Thanks to its high content of vitamin C, pomegranate is also a natural food that benefits out immune system--especially welcome in flu season. They also contains substances useful to protect the kidneys from dangerous toxins, with a positive impact on the liver. Eating the fruit--and the seeds--can also help lower cholesterol, lower blood pressure and prevent vascular disease. Eaten in the fall, it might also help with your seasonal allergies. There are some studies that show the fruit helps in lowering the instances of certain cancers, like breast and prostate. Its juice can work as a laxative and can stimulate appetite, help to combat nausea and hemorrhoids, as well as intestinal parasites such as tapeworm. Just about everything about pomegranates is good for you, but if you indulge too much they can make you drowsy... spill some on your clothing and the stain will be very difficult to remove. My recommendation: Eat as much as you want, take a nap afterwards and wear a bib. If you enjoyed this post, please share it with your friends. Grazie. Before Italy used the Euro, there was the Lira. Many didn't like the Lira because it was nearly worthless anyway. In fact,by the time the Lira was replaced, a 2000 Lire bill was only worth about one U.S. Dollar-- 20 Lira about one penny. Buying a nice dinner could cost tens of thousands... a car would be millions! But still, in 2014 Claudia Moretti thought she struck it rich. She discovered 100 million Lire in a safe hidden at her late Uncle's home on the Adriatic coast after having inherited it. With her father, she went to the house to start cleaning before starting renovations. After opening an old a cabinet which contained among other things an old gramophone, they came across a locked metal box. After breaking it open she found the surprise... one hundred million lire in cash. The bigger surprise came when she went to the bank and they told her it was worthless. Italy has been using the Euro for more than a decade and there was a 10 year limit on changing Lira to Euros... the limit had run out. She hired lawyers to fight the decision but lost her battle and lost her Uncles fortune. The lawyers surely won, however. Even if she could have cashed in on the stash of Lira, it would have only been worth around $65,000, hardly a fortune. But, she still had her Uncle's house. But wait, in Italy, usually property is shared by many family members... sisters, uncles, cousins... and there might be various rights on the deed that limit the use of the property. She might have an uncle that owns the rights to harvest the olive trees. There might be a cousin with the rights to the almonds... and another who has the right to spend summers in the house. "Owning" a property in Italy is not that simple... especially one that is inherited. Too bad she couldn't cash in all that Lire... Now, how does she stop Cousin Alfredo from digging up all "her" truffles? And Uncle Luigi expects to refurbish the grape vines--his "right" as per the deed. If you enjoyed this post, please share it. Grazie. Guglielmo Marconi was born at Bologna, Italy, on April 25, 1874, the second son of Giuseppe Marconi, an Italian country gentleman, and Annie Jameson, daughter of Andrew Jameson of Daphne Castle in the County Wexford, Ireland. As a boy he had an intense interest in the physical world around him. Educated first in Bologna and later in Florence, Marconi then went to the technical school in Leghorn, where, in studying physics, he studied the electromagnetic wave techniques of Augusto Righi, following the earlier mathematical work of James Clerk Maxwell and the experiments of Heinrich Hertz, who first produced and transmitted radio waves, and Sir Oliver Lodge, who conducted research on lightning and electricity. In 1894 he began laboratory experiments at his father's country estate at Pontecchio where he succeeded in sending wireless signals over a distance of one and a half miles. He used fairly crude apparatuses: an induction coil for increasing voltages, with a spark discharger controlled by a Morse key at the sending end, and a simple oherer (a device designed to detect radio waves) at the receiver. After preliminary experiments over a short distance, he showed that the range of signaling could be increased by using a vertical aerial with a metal plate or cylinder at the top of a pole. During this period he also conducted simple experiments with reflectors around the aerial to concentrate the radiated electrical energy into a beam instead of spreading it in all directions. In 1896 Marconi took his apparatus to England where he was introduced to Sir William Preece, Engineer-in-Chief of the Post Office, and later that year was granted the world's first patent for a system of wireless telegraphy. He demonstrated his system successfully in London, on Salisbury Plain and across the Bristol Channel, and in July 1897 formed The Wireless Telegraph & Signal Company Limited (in 1900 re-named Marconi's Wireless Telegraph Company Limited). In the same year he gave a demonstration to the Italian Government at Spezia where wireless signals were sent over a distance of twelve miles. In 1899 he established wireless communication between France and England across the English Channel. He erected permanent wireless stations at The Needles, Isle of Wight, at Bournemouth and later at the Haven Hotel, Poole, Dorset. Marconi’s great triumph was, however, yet to come. In spite of the opinion expressed by some distinguished mathematicians that the curvature of the Earth would limit practical communication by means of electric waves to a distance of 161–322 km (100–200 miles), Marconi succeeded in December 1901 in receiving at St. John’s, Newfoundland, signals transmitted across the Atlantic Ocean from Poldhu in Cornwall, England--a distance of 2100 miles. This achievement created an immense sensation in every part of the civilized world, and, though much remained to be learned about the laws of propagation of radio waves around the Earth and through the atmosphere, it was the starting point of the vast development of radio communications, broadcasting, and navigation services that took place in the next 50 years, in much of which Marconi himself continued to play an important part. In 1902, during a voyage in the American liner "Philadelphia", he first demonstrated "daylight effect" relative to wireless communication and in the same year patented his magnetic detector which then became the standard wireless receiver for many years. In December 1902 he transmitted the first complete messages to Poldhu from stations at Glace Bay, Nova Scotia, and later Cape Cod, Massachusetts, these early tests culminating in 1907 in the opening of the first transatlantic commercial service between Glace Bay and Clifden, Ireland, after the first shorter-distance public service of wireless telegraphy had been established between Bari in Italy and Avidari in Montenegro. In 1905 he patented his horizontal directional aerial and in 1912 a "timed spark" system for generating continuous waves. The most dramatic illustration of the importance of Marconi's wireless communications at sea was during the Titanic disaster. Marconi company radio operators notified other ships in the area and saved many lives. In 1931 Marconi began research into the propagation characteristics of still shorter waves, resulting in the opening in 1932 of the world's first microwave radiotelephone link between the Vatican City and the Pope's summer residence at Castel Gandolfo. Two years later at Sestri Levante he demonstrated his microwave radio beacon for ship navigation and in 1935, again in Italy, gave a practical demonstration of the principles of radar, the coming of which he had first foretold in a lecture to the American Institute of Radio Engineers in New York in 1922. He has been the recipient of honorary doctorates of several universities and many other international honours and awards, among them the Nobel Prize for Physics, which in 1909 he shared with Professor Karl Braun, the Albert Medal of the Royal Society of Arts, the John Fritz Medal and the Kelvin Medal. He was decorated by the Tsar of Russia with the Order of St. Anne, the King of Italy created him Commander of the Order of St. Maurice and St. Lazarus, and awarded him the Grand Cross of the Order of the Crown of Italy in 1902. Marconi also received the freedom of the City of Rome (1903), and was created Chevalier of the Civil Order of Savoy in 1905. Many other distinctions of this kind followed. In 1914 he was both created a Senatore in the Italian Senate and app ointed Honorary Knight Grand Cross of the Royal Victorian Order in England. He received the hereditary title of Marchese in 1929. In 1905 he married the Hon. Beatrice O'Brien, daughter of the 14th Baron Inchiquin, the marriage being annulled in 1927, in which year he married the Countess Bezzi-Scali of Rome. He had one son and two daughters by his first and one daughter by his second wife. His recreations were hunting, cycling and motoring. Marconi died in Rome on July 20, 1937. --If you enjoyed this post, please share it on social media. Grazie. What Language is Spoken in Italy? Italian + 226 Dialects, of Course! I knew there were local and regional dialects in Italy. I knew that my Mom spoke a dialect from Naples area and my Dad spoke a different dialect--from Molfetta. Mom said when Dad was speaking, it was like listening to a foreign language. Before I Voyaged to Italy I read a book called Pan' e Pomodor that talked about life in Puglia where my Dad was from. It was interesting to learn how local some dialects really were... words and expressions totally changed often from one village to another or from one hilltop to another. But when I stumbled across this map of the dialects in Italy I was dumbfounded. Some even say there are literally thousands of local dialects, not merely hundreds. There are several reasons for this phenomena: Italy didn't become one country until the late 1800s; there was nothing in the original Italian Constitution that specified one national language; many areas of Italy are extremely rural in rough terrain which causes a village to evolve separately from others; Italy has been conquered by many different peoples throughout history--Germans, Turks, French and more; many of the dialects are based on "Vulgar Latin", evolving over many centuries into their own dialect lineages; there are even areas of Italy that speak Griko, a form of the Greek language and villages that speak mixed dialects of Albanian and Croatian. As an example, the small island region of Sardinia has no less than six dialects in use today. Dialects are used by a majority of Italians and spoken as a primary language by 15% of the population. The strange fact is that many Italians speak their local or regional dialect at home, but speak the Italiano language when outside their home area. For instance, I read in Pan' e Pomodor that parents teach their children never to speak dialect outside of their village, especially when trying to find work in Rome or Milan, because they will be looked down upon. It's a shame because the various dialects and regional differences is exactly what makes Italy such an interesting, rich country. I remember when taking the train from Bari to Rome the conductor made announcements in three languages: English, Italian and Dialetto. So if you're Voyaging in a remote part of Italy and find it difficult to get the locals to understand you--even when speaking your best Italiano, be patient and remember they might only speak their dialect. Enjoy their uniqueness and speak a more universal language... a smile. If you enjoyed this post, please pass it around to your online friends. Ciao! You use the lines in the middle of the road as a special lane for your Vespa. For those of you who want to check in with Grand Voyage Italy while on Facebook, click the photo below to take you to our page. Chat, share and post your own photos of Italy. Ciao!